During our discussion of soap based shampoos I promised I would complete a guide to detergent based shampoos. This guide seems quite necessary, as detergent based shampoos with pure ingredients seem to be an endangered species. However, I tracked down a shampoo by Soapie Skyes that bucks the trend. 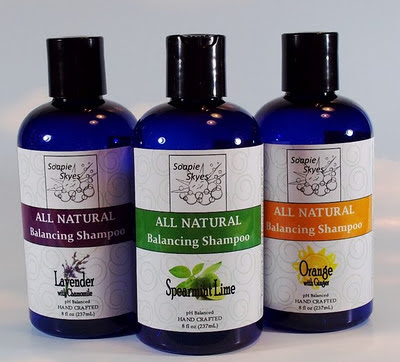 Soapie Skyes shampoo uses decyl glucoside and coco glucoside as the cleansing agents. These detergents are two of the safest and gentlest surfactants available, as I've discussed before. They will clean your hair without stripping it or damaging the hair follicle. The shampoo comes in three different scents: lavender chamomile, spearmint lime and orange ginger (my favorite). Originally I was going to do a full review of this shampoo, but they are having a massive sale! I didn't want you to miss it, so for Black Friday go buy yourself an 8oz bottle for only $5! This should really be a Budget Edition Post, because I've never seen even a borderline eco-friendly shampoo for such a great price. All you need to know is that this shampoo suds nicely, leaves your hair feeling exceptionally clean, but moisturized, and has the cleanest ingredients on the market. I've spoken with the owner and her friendly approachability and commitment to creating clean products makes me love her line even more. She even custom blended a shampoo for me! Water, Decyl Glucoside, Sodium Cocoyl Hydrolyzed Soy Protein, Hydrolyzed Soy Protein, Coco Glucoside, Glyceryl Oleate, Lauryl Glucoside, Glycerin, Citric Acid,Thyme Oil, Oregano Oil.